IURDP Mumbai Admit Card 2019 information is provided in this article. Candidates who had applied for the District Manager, Taluka Manager, Computer Operator, Clerk posts in the IURDP organization, they have to attend for the written test on the scheduled date along with IURDP Admit Card. The Integrated Urban and Rural Development Programs officials decided to conduct the IURDP Mumbai written examination from 20th to 23rd February 2019. For this purpose, the authority will declare the IURDP Mumbai Computer Operator, Clerk Hall Ticket 2019 one week before of the examination at www.iurdp.org. Competitors need to download the IURDP Mumbai Computer Operator, Clerk Call Letter 2019 by entering the login credential information. The IURDP Mumbai Admit Card 2019 plays an important role at the time of examination. So all the competitors must carry the IURDP Computer Operator Hall Ticket 2019 at the time of attending the written examination. Whatever information provided at the time of submitting the application form, that information will be available in the Admit Card. If any mistake is found, then intimate to the higher authority and make the corrections on or before the end date. Otherwise, aspirants will face a major issue at the test center. More details about IURDP Admit Card 2019 mentioned in the below sections. The Integrated Urban and Rural Development Programs (IURDP) officials will conduct the following selection rounds to pick the skillful candidates for the District Manager, Taluka Manager, Computer Operator, Clerk posts. Candidates have to use the below given details to download the IURDP Mumbai Admit Card 2019 from the official website. 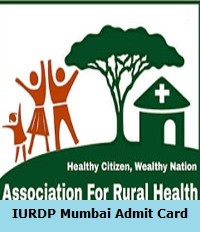 The IURDP Mumbai Admit Card 2019 carries the following information. Candidates need to carry any one of the documents from the below given list along with IURDP Mumbai Admit Card 2019 for the examination. IURDP main page will open. In that home page, Download Call Letter option will be available. A page will open about all exams admit card related. Check the IURDP Mumbai Admit Card 2019 link and hit on it. Enter Registration ID, Date of Birth details and press on submit button. Now IURDP Admit Card 2019 will display. View all available data and download it. Finally, take a print out of hard copy to carry for the examination. For more updates keep following Sarkari Recruitment on a daily basis. Thank you.